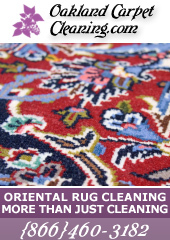 UCM Services Oakland rug cleaning service can offer you so much more than you might have imagined. We provide a full disinfectant and cleaning services, from A to Z, leaving nothing to chance. We believe in giving more than a hundred per cent to you, our valued customers. We will not stop just when the job is done, but when the job is done to your complete satisfaction. This attitude has helped make UCM Services Oakland the success it is today and we intend to do whatever it takes to maintain and build on that solid foundation. We understand the tremendous importance of your area rugs that were no doubt purchased due to their financial value as well as beauty and originality. We respect your rugs in the same way as you do and that is why our trained personnel and research department has spent many years developing the most accurate and appropriate cleaning materials to ensure your rugs are cared for delicately and expertly. They are more than just rugs - they are practically works of art. Rather than devaluate, invariably many of these rugs will actually increase in value. So that is why it is even more important that these rugs get the proper expert care and maintenance; even more than other objects in your home. Given this, what can UCM Services Oakland services offer you (and your rugs)? 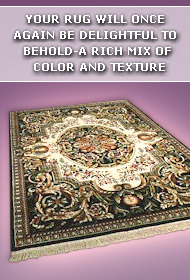 Since all rugs and carpets are different, we have developed specially tested products for your rugs. We send out our technicians to your home and their first task is to identify the specific fibers and dyestuff in your rugs so that they can then determine the most appropriate rug cleaning method that will treat your rugs in the best possible way. At UCM Services Oakland we use a heated cleaning solution followed by a deep vacuum powered cleaning. This leaves your valuable rugs smelling fresh and clean. Because at the end of the day, it has been proven time and time again that professional care and maintenance is the only true and trustworthy way of protecting these articles of value so that they will last to be heirlooms for generations to come, as was no doubt your original intention on purchase.